YOU HAVE THE right to expect a well-crafted, meticulously designed product from a band fronted by two academically-trained composers. "She, Sir bring verve back to common sound." "This is not your typical fare; this is what would've happened if shoegaze was around when Bach was growing up. "Intricately crafted" doesn't even begin to describe it." "Extremely avant-garde and artistic, and in many ways still ahead of its time. 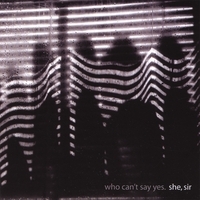 She, Sir take one step beyond traditional noise rock and make shimmering, hauntingly beautiful arrangements that not only emphasize great precision, but also move in unpredictable, often pleasantly surprising ways." "Instant classic that will drive me merrily insane." "With layer upon layer of guitars meticulously put together, and muted melodies over droning drums, She, Sir have created a sound that is as opaque as it is alluring...these classically trained Austin Texas natives are taking shoegaze to places that have not yet been tread."